And with one typically evocative line of dialogue, delivered by his country’s most popular President, the show’s creator Aaron Sorkin seemed to confirm America’s enduring allergy to the game of its former colonial masters – now the second most popular sport in the world. But cricket and America were not always mutually exclusive. Indeed, in sporting terms, the game was America’s first love. 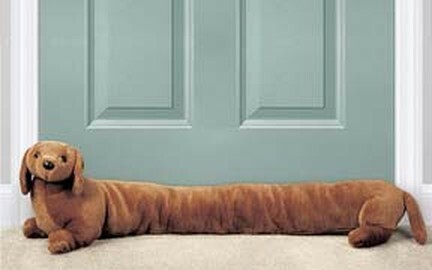 Up until the mid-19th century, it enjoyed huge popularity in North America, particularly in Philadelphia, where it was something of a craze. Indeed the first ever game of international cricket – and of international sport – was played not between Australia and England, but between the United States and Canada, in Manhattan in 1844. For the record, Canada won by 22 runs, a result the press at the time attributed to poor American fielding. But following the Civil War, and baseball’s all-conquering rise to the status of national pastime, cricket began a concurrently steep and permanent decline in the US. But in Philadelphia, the game’s last stronghold, cricket continued to rival baseball for popularity and spectator attendances right up until the 1920s. The city had a strong first-class team – the Gentlemen of Philadelphia – which regularly toured England, and even produced one celebrity player, Bart King, briefly recognised as the best in the world after topping the English bowling averages on a tour in 1908. And it’s in Philadelphia that America’s only full-time college cricket program remains active to this day. Haverford College, a leafy, boutique liberal arts institution in the city’s north-western suburbs, founded its first team in 1834 – the first in the United States made up entirely of American-born youth – and the game has been played there continuously ever since. 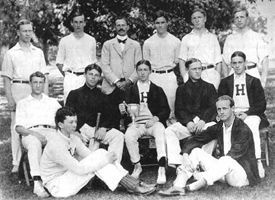 Allegedly introduced by an English gardener who’d been hired to landscape the new campus, today Haverford boasts the only varsity cricket team in the United States. The college also houses the CC Morris Cricket Library and United States Cricket Museum – the country’s major cricketing archive, and the largest collection of memorabilia in the western hemisphere. “I’ve been involved with cricket here for almost 40 years, since my student days,” recalls Haverford’s Pakistani-born director of cricket, Kamran Khan. Khan, a former fringe member of the Pakistan national team (he was once 12th man in a test against Richie Benaud’s Australian side), arrived in Philadelphia in the early 1970s, on a scholarship to study international relations at nearby Villanova University. His first sighting of cricket on a college campus came when he was invited by a friend to visit the beautiful grounds at Haverford. The man who offered Khan a job – as well as smooth passage to a Green Card – was former college president William Comfort, one of those who’d worked to keep cricket’s flame alive at Haverford, long after the game had become an anachronism. Every year, he says, around twenty or more players will sign up for the cricket program, many of who weren’t quite good enough to make the cut for baseball. Some of these are always foreign students from sub-continental or Commonwealth backgrounds, but a large number over the years have been American students previously unfamiliar with the game. 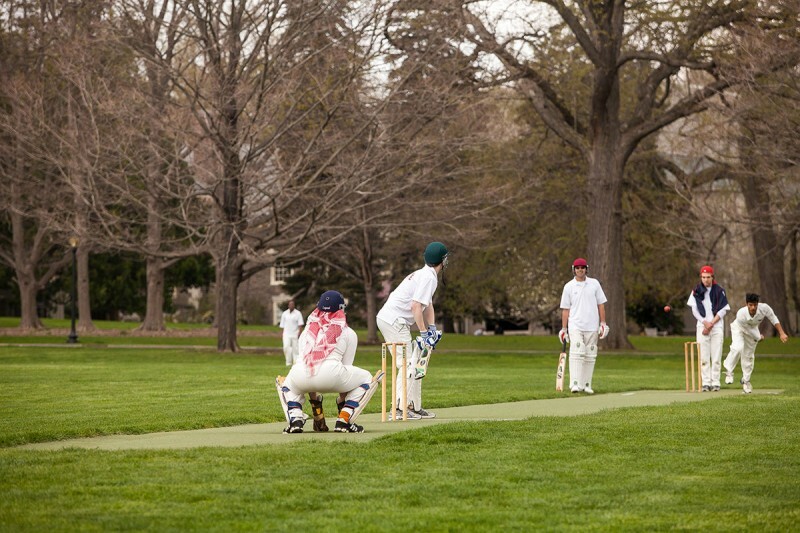 Haverford has grounds that are used exclusively for cricket, including a number of Astro Turf pitches, and a pavilion that is as old as the college itself. It is one of the few fully-equipped cricket grounds in the country, with the same facilities you might find at an English village venue. The college has sent its team on a number of tours to England, including one in 1996 where they suffered only one loss, playing against sides from Oxford and Cambridge, amongst others. At home, Haverford still plays against local rivals such as the University of Pennsylvania, but unlike Haverford, these colleges don’t have full-time varsity level cricket, and can only get a side together in years when they have a good intake of foreign students. As the only team that has been continuously playing for almost 150 years, Haverford is forced to fill its schedule playing against various local club teams, and in tournaments and festivals. One such event is the Philadelphia International Cricket Festival, a popular charity tournament that’s been staged annually for the last 23 years at the well-heeled Philadelphia Cricket Club. Founded in 1854, the festival’s home venue is the oldest country club in the United States, and had been a cricket club in name only for around seventy years, until the game was revived there in the 1990s. The festival’s four days of “gentlemen’s” T20 games, held over the first weekend in May, are played on a combination of turf, matting and Astro Turf pitches at a number of sites around Philadelphia, including other historic cricket clubs at Germantown and Merion, as well as the British Officers Cricket Club at Evansburg State Park, and Haverford College. This year the festival will feature over twenty teams, and its guest of honour will be former Australian paceman Michael Kasprowicz, who will be playing and running clinics. Indeed, the list of previous special guests reads like a Wisden honour roll: Gary Sobers, Dennis Lillee, Richard Hadlee, Gary Kirsten, Mark Boucher, Fred Trueman, Richie Richardson, Derek Murray and Jonty Rhodes, amongst others, are all past attendees. “They’re first of all shocked that there’s any cricket being played in the United States,” Culp says, “but it’s also a good reason to come to the US for a week or two, and when they’re here they’re much more anonymous than they are at home, so they can go out to places. We cricketers know who they are, but there aren’t many of us! Culp says cricket only became an active part of the Philadelphia club’s name again thanks to former top New Zealand tennis player and coach Ian Crookenden. Culp says the Festival has built up a sense of camaraderie amongst all of the local clubs, which has in turn allowed them to revive the Gentlemen of Philadelphia team – the same composite side that once regularly toured England up until the ‘20s, and featured world-renowned players such as Bart King. The current edition, although not of first-class standard, has made tours to England, Buenos Aires and South Africa. He still gets great enjoyment from his role at Haverford, however, even after 40 years. And the varsity funding support his program receives, unique in the country, makes his job comparatively easy.